Extraordinary comfort and utility, the Puma IP Outdoor knife is an excellent choice for an all-purpose fixed blade knife. The 4.5" drop point blade can split wood, prep for a fire, process a deer or clear a trail. 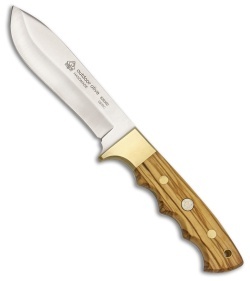 Beautiful olive wood handle scales are extremely comfortable and secure in hand with contoured finger grooves. A polished brass bolster doubles as a finger guard and is a nice contrast to the inlayed Puma medallion. 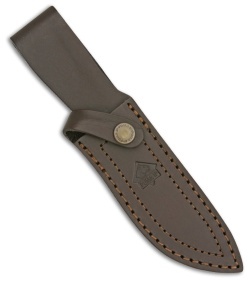 Carry the Puma Outdoor into the field or campsite with the embossed dark brown leather sheath.